Here is a lecture by Ken Malmin (Dean of Portland Bible College), taken from his Basic Doctrine course. Existence of God, Ken Malmin from Portland Bible College on Vimeo. 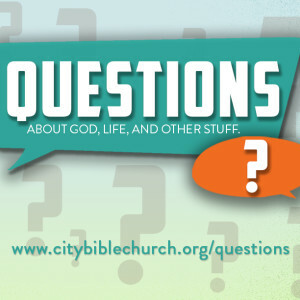 Here are a few recommended sources related to the new sermon series, Questions. This is a short article introducing a person to the four main classical arguments used to support the existence of God. They represent logic arguments used to support the existence of God taken from history, science, personal experience, and philosophy. This is an more extensive article about the four classical proofs of God. Well known theologian William Lane Craig explains each of the proofs and then uses them against the ideas of well known atheist Richard Dawkins. The article helps to expose some of the weaknesses in Dawkins’ argument. This is a chart briefly summarizing some of the key arguments for God’s existence. It has been adapted from Charts of Christian Theology and Doctrine by H. Wayne House. C. S. Lewis opens his famed book, Mere Christianity, by presenting a convincing case for the existence of God. I am going to summarize his argument here; but I recommend you purchase the book and read it for yourself—it’s an easy-to-read classic. Lewis begins with a description of people arguing over some misdeed that has been committed. Cutting in line. Stealing a seat. Breaking a promise. He notes how fascinating it is that people always make the claim that the offending deed was wrong. Even if they don’t make that claim outright, the fact that they are so upset indicates that they believe some rule has been broken. Moreover, the offender hardly ever says, “To hell with your standard” (Lewis’ words). Instead, he explains why his actions were justified—he had some special reason for breaking the rule. This, of course, admits that there is in fact a standard. And if the offender is so bold as to claim that there is no standard—that he can do whatever he wants—he almost always appeals to this very standard when someone wrongs him later on! Lewis then claims something bold. The above scenario indicates that there is indeed a basic universal standard of morality governing all humans. Sure, different civilizations have had slightly different perspectives about how morality should play out; but there have never been any major differences between societies regarding basic morality (a point further defended as Lewis continues). But the astounding thing is this: though we all sense obligation to this Moral Law, none of us really keep it! Over time “we have all failed to practise ourselves the kind of behaviour we expect from other people.” And when we do fail to practice it, we almost always make excuses for why our failure is understandable, given the circumstance. Of course, this just further proves how real the Moral Law is to us and how obligated we feel to keep it. If there is a Moral Law, there must be a Lawgiver. God is the best explanation for the fact that all humans have, more or less, this concept of right and wrong. If you find any of this compelling, or if you have some objections to Lewis’ logic (or rather my imperfect summary of it), please watch this video. It is a reading of a chapter from Mere Christianity in which Lewis tackles some of the major objections to his claim. Here are a few books that you may find helpful if you are interested in delving further into the questions in our sermon series. These books address the issue of God’s existence; and many of them also address the other questions in our series. We will be adding to the list over the coming weeks. As our church goes through this series, we will be digging deeper and adding more in-depth material to help you with these questions. Please come back and check out our posts!